Welcome to Ergo Vancouver, a Canadian-owned business based in Burnaby, British Columbia. Ergo Vancouver is a reseller of ergonomic products for the computer and offers personalized service in determining solutions for your computer-related ergonomic problems. Ergo vancouver can also provide ergonomic assessment and related services. See our Services section for more information. If you are considering purchasing products from Ergo Vancouver please be aware that all sales are final. See our Returns section for more information. Check our clearance page. New items were added as of 2017/07/27. Musicians: Click here for suggestions of products that might help with your playing or composing. 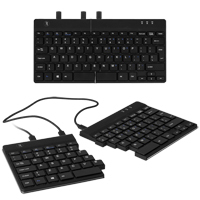 Coming soon: the Kinesis Freestyle Pro Keyboard. 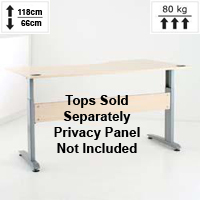 Looking for an inexpensive electrically height-adjustable desk? Sold as base only, this height-adjustable unit does not come with a modesty/privacy panel. If you have access to a woodworker or handyman this may be your cheapest solution for an electircally height-adjustable base. Please e-mail for an estimate. 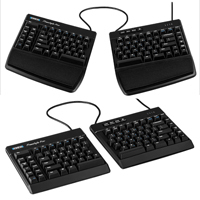 The R-Go Split Ergonomic Keyboard.